The Star of Bethlehem, that is. 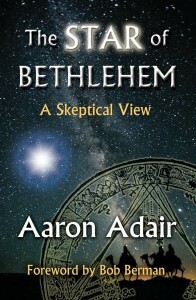 Aaron Adair is the author of the go-to book on the star, looking at it critically and scientifically: The Star of Bethlehem: A Skeptical View. Here, podcasters from Patheos Andrew Hall and Jack Matirko speak to Adair about the star, astrology, astronomy and the Bible. Great stuff.